It’s five years to the day after dear old Ebenezer Scrooge has passed away and left his thriving firm to his former clerk, Bob Cratchit. However, Bob’s overly-generous benevolence with lending and charity-giving has driven the company into the ground, on the verge of bankruptcy. And so the ghost of Scrooge returns one Christmas Eve to teach Cratchit the true meaning of money, with the help of visitations of three spirits – not all of whom are happy t be there. (It is Christmas Eve, after all, and they have other plans.) Making the swirling journey through Christmases past, present, and yet-to-be all the more of a chaotic ride for Cratchit are the dozens of characters from other Dickens novels woven throughout the story, together for the first time. God bless them, most everyone. And it’s all augmented with footnotes of letters between Mr. Dickens and his publisher, along with notes from Dickens’s own hand and scholarly research. At least that’s what the editor tells us, though we’re a little skeptical of his honesty. Robert J. Elisberg has been a commentator and contributor to such publications as the Huffington Post, Los Angeles Times, Los Angeles Daily News, Los Angeles Magazine, C/NET and E! Online, and he served on the editorial board for the Writers Guild of America. He has contributed political writing to the anthology, Clued in on Politics, 3rd edition (CQ Press). 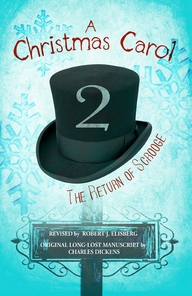 Among his other writing, Elisberg wrote the comic novella, A Christmas Carol 2: The Return of Scrooge, which reached #2 on Amazon’s Hot List for Humor/Parody. His most recent novel is the swashbuckling adventure, The Wild Roses. He co-wrote a book on world travel. Currently, he writes a tech column for the Writers Guild of America, west. He also co-wrote the song, “Just One of the Girls” for the Showtime movie Wharf Rat, and wrote the book for the stage musical Rapunzel!. Born in Chicago, he attended Northwestern University and received his MFA from UCLA, where he was twice awarded the Lucille Ball Award for comedy screenwriting. Not long afterwards, Elisberg sold his screenplay, Harry Warren of the Mounties. He was on staff of the international animated series, Flute Master, and co-wrote three of the Skateboy films based on it. He also co-wrote the independent film, Yard Sale. Most recently, he wrote an adventure screenplay for Callahan Filmworks. I’m a fan of Dickens, and I’m also open to pastiches, which means A Christmas Carol 2: The Return of Scrooge was very likely going to be something I enjoyed. Nevertheless, I approached it a little nervously. I don’t like to give reviews. Obviously not everyone likes everything they’re given to read, but…What would I do if it wasn’t FUNNY? My fears were assuaged almost instantly, and forgotten by the time I reached the first footnote. What? Didn’t anyone warn you that this book is annotated? Well it is, with a lovely footnote for every new/old character, talking about their appearance in the main body of Dickens’ work, and why he included them in this ‘lost’ novella. The voice of the book isn’t quite Dickens as we know him, but could easily be unedited Dickens after a few shots of tequila – er, um – Smoking Bishop. The self-referential humor works every time, and the other bits of humor (sending a Jewish character to be a ghost on Christmas Eve, and having him complain about it) are dead-on. 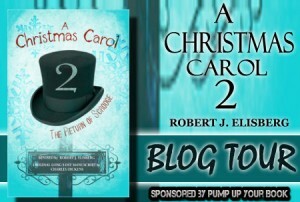 In A Christmas Carol 2 Elisberg has not only given us an entertaining read, he’s helped the story live in contemporary times, showing us that the best path is neither abject poverty nor total profit, but a balance of the two. Those who are familiar with the original Dickens work, or any of his novels, will gain the most enjoyment from Elisberg’s so-called revision, but even readers new to his work will get a laugh or two. Writing pastiche is hard. Writing effective parody is even harder. Elisberg has managed to do both, successfully, and I enjoyed reading it very much. Goes well with a slice of mince pie, and coffee laced with brandy.